At PetStar Animal Care we believe the best medicine is a comprehensive exam. Our doctors are highly qualified to examine your pet from nose to tail, taking care to detect possible complications that our pets cannot tell us about. As your pet ages, its veterinary care changes with the stages of life. We know the best veterinary care for each stage. That’s why we created PetStar Wellness Plans that are tailored to your pet’s stage of life. It is proven that when these plans are followed, pets will live longer and healthier lives. PetStar’s Puppy Wellness Visits start at 6 weeks of age and end at 16 weeks of age. A comprehensive exam and intestinal parasite screening are performed at each visit. DAPP vaccinations are given at 6, 9, 12 and 16 weeks of age. Leptospirosis vaccinations are given at 12 and 16 weeks of age. The Bordetella vaccination is given at 12 weeks of age. The Rabies vaccination is given at 16 weeks of age. During your Puppy Wellness Visits, a PetStar team member will provide you with important information, such as: microchipping, puppy training, diet recommendations, heartworm prevention, and strategic internal and external parasite prevention. PetStar recommends Advantage Multi or Trifexis based on your pet’s needs. This information is tailored to your puppy’s needs and presented to you in a Report Card at the end of every visit. Through extensive client education and quality care we hope to start you and your puppy on the road to a healthy and happy future. PetStar’s Kitten Wellness Visits start at 9 weeks of age and end at 16 weeks of age. A comprehensive exam and intestinal parasite screening are performed at each visit. FeLV / FIV testing is discussed at the 9-week visit. HCP vaccinations are given at 9, 12 and 16 weeks of age. Leukemia vaccinations are given at 12 and 16 weeks of age. The Rabies vaccination is given at 16 weeks of age. During your Kitten Wellness Visits, a PetStar team member will provide you with important information, such as: FeLV/ FIV testing, microchipping, diet recommendations, heartworm prevention, and strategic internal and external parasite prevention (Revolution). This information is tailored to your kitten’s needs and presented to you in a Report Card at the end of every visit. Through extensive client education and quality care we hope to start you and your kitten on the road to a healthy and happy future. Prevention is the key to keeping your pet healthy! PetStar Animal Care recommends a comprehensive semi-annual physical exam. A thorough physical exam can detect a variety of illnesses and prevent potential catastrophic diseases. Your pet will live a longer and healthier life through the early detection, diagnosis and treatment of complications. In addition to the semi-annual comprehensive physical exams, PetStar veterinarians recommend performing an intestinal parasite screening every six months, and heartworm testing every year. We recommend a Bordetella vaccine once every year and Leptospirosis once every year. The DAPP is recommended once every three years, following the puppy series and 1 year booster. The Rabies vaccine is required by law once every three years, following the initial vaccine and 1 year booster. We will also ensure that your canine companion is current on our recommended heartworm, internal and external parasite preventatives, such as: Advantage Multi, Bravecto, Trifexis and ProHeart. In addition to the semi-annual comprehensive physical exam, PetStar veterinarians recommend performing an intestinal parasite screening every six months. We recommend annual FeLV/FIV/heartworm testing for at-risk pets. We recommend HCP vaccination once every three years and Leukemia vaccination once every two years for at-risk pets. The Rabies vaccine is required by law once every three years in a fully vaccinated pet. We will ensure that your cat is current on PetStar’s recommended feline heartworm, intestinal parasite, and flea preventative, Revolution. The best kind of health care for pets is the preventative kind. The earlier we can detect problems, the better we can control them. A basic wellness exam should include a thorough health history and comprehensive blood work. PetStar offers wellness profiles through IDEXX Laboratories. 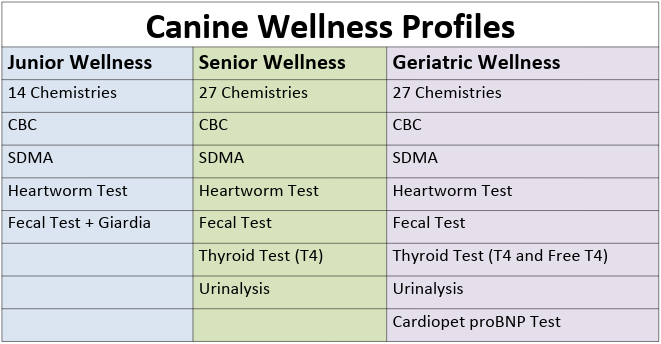 Ask us about which profile is best for your pet during your next wellness visit! In animals, just as people, old age isn’t just a number. At age seven, some dogs may still display the vibrancy they had as puppies while others will have gray muzzles and be stiff and achy. Because of the differences in how individual animals age, be sure to discuss any planned changes in your pet’s care ahead of time with your veterinarian. For example, switching to a senior diet once you see a few gray hairs may not serve your pet well if it’s still active and in need of the extra energy found in adult maintenance food. Based on test results, your veterinarian may recommend additional testing to rule out or diagnose suspected problems such as kidney failure, Cushing’s Syndrome, liver deficiencies, among other ailments. Digital radiographs or ultrasounds may be necessary to diagnose heart, lung or skeletal problems. Microchipping is safe, effective, durable and dependable. However, it cannot guarantee that a lost pet will be found. It is always best to have more than one form of identification. With the addition of a microchip, there is a chance that your lost pet may come in contact with a scanner along its journey home. Ask about the best kind of identification during a puppy or kitten wellness visit. PetStar uses Home Again microchips. Our price is $57.50 which includes the chip implantation and first year or registration through Home Again. The registration is $19.99 per year thereafter, if you choose to keep your pet registered. Learn more about Home Again microchips and the importance of registration at the Home Again website HERE. Currently, microchips do NOT contain GPS technology. The chip contains a unique number that will identify your pet, but it cannot locate your pet for you. If you are interested in GPS technology for your pet, please visit our RESOURCES page. Can the chip wear out? Will it need replacement? There is nothing to wear out or be replaced. There are no batteries or moving parts. The microchip will last throughout your pet’s lifetime. The procedure is simple, routine and painless. It does not require anesthesia. Your pet gets an injection under the loose skin between the shoulder blades, similar to a vaccination. You may elect to have this done during an elective surgical procedure, such as spay or neuter. How common are scanners at shelters and veterinary facilities? The three major manufacturers offer microchip readers to humane societies, shelters and veterinary clinics at little or no cost. PetStar’s scanner reads all brands of microchips. Is it possible to have duplicated chip numbers? These tiny microchips can hold vast amounts of information and are designed to produce 225 billion different identification numbers. Each chip also has unique codes to identify the manufacturer, which produces enough numbers for each pet to have a unique number. What about having a foreign object in my pet? Veterinarians have been implanting microchips for years and the process has been proven safe. PetStar Animal Care uses the HomeAgain brand, constructed of an inert, biocompatible substance. That means it won’t cause an allergic reaction in your pet. Get a chip with anti-migrating properties, so there are no concerns about the chip moving near any delicate tissues or organs.